Soke Solano was born in 1942 in Aguadilla , Puerto Rico . He lived and was raised in the U.S. since the age of 5. His first experience in the Martial Arts was in 1958 in New York City in the art of Jujutsu. In late 1969 he started practicing Kung Fu (Wing Chun) in lower Manhattan , N.Y. ( China Town ). In 1970 he moved to Puerto Rico where he started practicing a Japanese Karate system (Garyu Rico Do) with Grand Master Gilberto Rodriguez. In 1972 he return back to the U.S. to N.Y. in which he return to the practice of Wing Chun Kung Fu with Sifu Chow Chun in downtown Manhattan. During that same year he and his family decided to move down to Daytona Beach , Florida where he started practicing Yoshukai Karate. At the end of 1975 he decided to return to Puerto Rico . As a Brown Belt in Yoshukai Karate. He establishes his first Dojo in 1975 in the garage of his home. Upon his visit to the Hombu Dojo in Florida , USA he tested and got his Shodan (1st Dan) on July 4, 1977 at the Yoshukai yearly camp in St. Leo College , Tampa Florida . His Nidan on July 1978 and Sandan on February 1980. He proudly represented Shihan Mike Foster and the Yoshukai Karate style until 1981. During these years he promoted a few of his students to the Shodan level in Yoshukai Karate. Just to name a few: Osvaldo Casiano, Carlos A. Diaz, Julio Gil De Lamadrid, David Bauzo, among others. On December 1981 he decided to establish his own organization. With the support of Grand Master Peter Urban better known as the Father of American Karate and the College of Dans, he was promoted to 4th Degree Black Belt (December 29th, 1981) this promotion took place at GM Urban’s home in New York. On August 23, 1982 he was promoted to 6 Degree Black Belt (Shihan) and recognize as founder of his own Karate & Kobudo organization better known as the Yoshu Ryu International Karate & Kobudo. Throughout his dedication and research of the traditional Japanese Martial Arts he developed a great desire to learn a traditional Okinawa system. In 1985 he traveled to Okinawa the birth place of Karate where he had the honor to meet and practice with Supreme Grand Master Fusei Kise, official heir of the “Matsumura Seito Karate”, founder of the “Okinawa Shorin Ryu Karate & Kobudo Federation, Kenshinkan”. In later years he practice with Grand Master Yuichi Kuda (Matsumura Seito Lineage), founder of the ” Okinawa Shorin Ryu Matsumura Kenpo Karate and Kobudo Association”. On January 1986, upon his return from Okinawa Mr. Solano was representing Grand Master Fusei Kise. In June, 1988 Grand Master Fusei Kise visited Puerto Rico in which he tested and promoted Mr. Solano to the grade of Nanadan (7th Dan), Kyoshi in “Okinawa Shorin Ryu Karate & Kobudo”. In 1992, Mr. Solano was also tested and promoted to 7th Dan (Nanadan), Kyoshi in “Okinawa Shorin Ryu Matsumura Kenpo Karate & Kobudo” by Grand Master Yuichi Kuda of Okinawa and by Hanshi George W. Alexander, the USA representative for the Matsumura Kenpo Karate & Kobudo Association at that time. In 1994 Mr. Solano had establish his own organization, the Okinawa Shorin Ryu Kokusai Kempo-Karate-Do & Kobudo Federation, Inc. an non profit organization dedicated to the preservation and teaching of the Orthodox and Traditional Okinawa Martial Arts (Kempo-Karate, Kobudo, Tuite Jutsu and Kyusho Jutsu ). He names his system ” Okinawa Shorin Ryu Kempo-Karate-Do and Kobudo” in honor to his Teachers (Kise & Kuda) from Okinawa. In 1994 Mr. Solano was promoted to 8th Dan by Dr. Bernie Weiss and Duke Moore, Hanshi of the American Teachers Association of Martial Arts (ATAMA). In April, 2000 Mr. Solano was recognized and certify as Hanshi, 10th Dan by the “International Matsumura Seito Society” and its Supreme Grand Master Tom Hunnicutt and Supreme Grand Master Dave Shelton Pioneers of the Matsumura Seito in the USA. Hanshi Solano is very proud to be a Lifetime member and representitive of this Society. In 1993 he Founded the Latin-American Martial Arts Society / World-Wide Hall of Fame. On September 2001 Hanshi Solano was recognize by and was also elected President of the Latin America Martial Arts Grandmaster & Soke Council, Inc. a non profit organization dedicated to the recognition and unification of all Martial Artist that are Founders and Masters of their own independent system, school or organization. In the year 2006 he decided to re-organize the Council and re-named it the Latin-American Martial Arts Masters & Soke Council. Hanshi Solano is also the Founder and President of the “Puerto Rico Martial Arts Federation (PRMAF) Inc. a non profit organization dedicated to the unification of the Martial Arts styles in Puerto Rico . With over 500 active members, this organization has achieved many of his objectives. Accredited by the Department of Sports and Recreation of Puerto Rico , PRMAF has his own Tournament Circuit and Rules which are use in all Rated events. Hanshi Bill Solano has been inducted into the following Hall of Fame: “International Karate Hall of Fame”, “Eastern USA Martial Arts Hall of Fame”, “The Florida Brotherhood Martial Arts Hall of Fame” and the “Latin-American Martial Arts Hall of Fame”. He was Inducted as “Grand Master of the year by the “USA Martial Arts Association Hall of Fame” and on June 9th, 2001 he was inducted into the World Wide Martial arts Hall of Fame as Grand Master of the Year. On September 1st, 2001 Hanshi Solano was accepted as a lifetime member and was also certify as Hanshi 10th Dan by Supreme Grand Master William A. Rankin, Soke and the United State Martial Artist Association. He has been recognize and certify and as a Lifetime member of the “King’s Kung-Fu Association and the Universal Fighting Arts Federation which is headed by Sijo Richard Mieir-King. In 2002 Hanshi Solano was also inducted into the Hawaii International Martial Arts Society. He is a lifetime member and has been Certify as a 10th Degree, Grand Master, by this Society. He is also very proud and Honor to have been Inducted and accepted as a Lifetime member into the prestigious “Pioneers and Legends International Martial Arts Society Hall of Fame”. As a competitor Mr. Solano distinguished himself during the 80’s winning various awards in Kata, Kobudo and Kumite Championships. He recently competed in the 2007 “Disneys’s Martial Arts Festival & Championship held at the Worldwide Sports Complex in Disney World in Orlando, Florida where he won fist place (Gold) in Kobudo. Besides competition, he has always been known as an excellent Teacher, Seminar Instructor, Counselor and Tournament Promoter. He greatly believes in being an example and that a Martial Artist should get involved in every aspect of the Martial Arts. 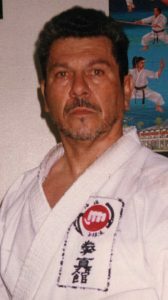 Hanshi Solano is the Pioneer of the Matsumura Seito (Orthodox) Kempo-Karate & Kobudo and Tuite/Kyusho Jutsu (Dinmak) for Puerto Rico, Central America, Chile and Venezuela . The first Puerto Rican to be tested and promoted to the grade of 7th Dan (Nanadan), Kyoshi by two well known Okinawan Grandmasters and world-wide organizations of the Matsumura Seito(Orthodox), Shorin Ryu lineage. “Okinawa Shorin Ryu Kempo-Karate-Do & Kobudo” system. The Okinawa Shorin Ryu Kokusai Central Headquarters are located in San Juan, Puerto Rico, with Direct Membership Branches in the following places: U.S.A. & Puerto Rico / With Honorary Members in the USA , Panama , Venezuela and the Dominican Republic. This organization is accredited by the Department of Sports and Recreation of Puerto Rico (Reg.#0080). Hanshi Solano is available for seminars and clinics relating to Shorin Ryu Kempo-Karate & Kobudo and other traditional & modern Martial Arts systems. Membership is open to all styles that would like to be part of an organization that is dedicated to the practice, preservation and teaching of the orthodox (Seito) and Traditional Okinawa Bu-Jutsu.